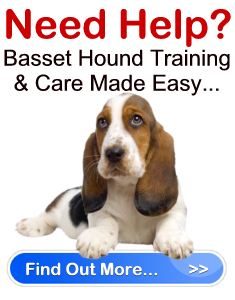 All About Basset Hound Puppies " "
Basset Hound puppies are very small, long bodied and low to the ground. They virtually look like miniature versions of their adult selves. Like all purebreds, the Basset Hound has a breed standard that you need to be aware of when selecting your pup to ensure you choose the one that is both happy and healthy. First of all, you should carefully observe the temperament of the Basset Hound puppies. They should be very friendly and affectionate, and not overly timid or aggressive. Secondly, you need to closely analyze the appearance of the pup, starting with the head. They have a round skull and a pronounced occipital bone. The foreface should be lean, and the muzzle is parallel to the top of the head. The upper lips of the Basset Hound overlap the lower lips, and the teeth of the Hound should meet in a scissor bite. The nose at the end of the muzzle may protrude just beyond the lower lips, and features large, wide nostrils. The nose is generally black, but may be liver in lighter colored dogs. The dog should have a moderate amount of loose skin and wrinkling around the face, particularly the eyes. The eyes of Basset Hound puppies are large and soulful. They do not protrude, nor are they sunk-in, and are a lovely dark or medium shade of brown depending on the coat color. They have a calm, friendly expression. The ears, one of the most characteristic features of the Hound, are set very low and are long. They should extend just beyond the nose end. The velvety ears are quite narrow and they curl inwards. Basset Hounds have a muscular neck that has a predominant arch and is quite long. The neck extends into their long and deep body. They have rounded ribs that are well sprung. Their back is long, level and broad. Their back extends into their long tail. The tail has a strong base and is carried high with a slight curve. The front legs are very powerful and short. The back legs are muscular and have well bent stifles. Wrinkles may occur on all four legs close to the foot. The feet are knuckled and well padded and are usually straight. However, the front paws may be slightly angled outwards. Basset Hound puppies should not be stiff in movement and should move freely. The coat of the Basset Hound is smooth and short without feathering. The typical coat coloring is tricolor – black, white and tan. There is also a bi-color coat – Lemon and white. However, virtually any color that is recognized in the Hound group is considered acceptable. You need to keep all of this and mind as you select Basset Hound puppies and when looking at the parents of the litter.